Why do home winemakers love using a bucket to ferment and bottle from? EASE! Going from spigot to bottle will reduce the time your wine is exposed to oxygen. It’s easier to control filling bottles than with a siphon. It’s easy to clean, easy to carry, and easy to transfer. 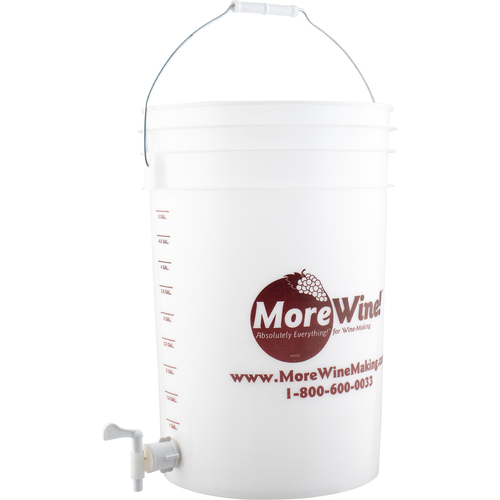 You will love our six gallon, food grade bucket with built in spigot and external volume markings up to five gallons. The outlet barb accepts 3/8" ID vinyl tubing. 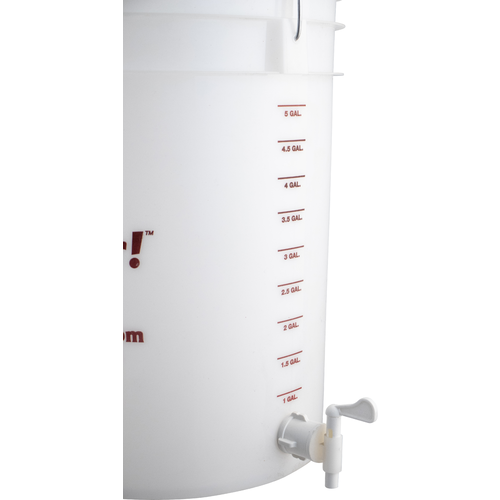 To use as a fermenter you will need to pick up the optional lid, a stopper, and an airlock. Includes our new Sediment Block Spigot, which will help minimize sediment uptake as you rack after fermentation. If using this as a bottling bucket, simply rotate the internal portion of the spigot to maximize product output. 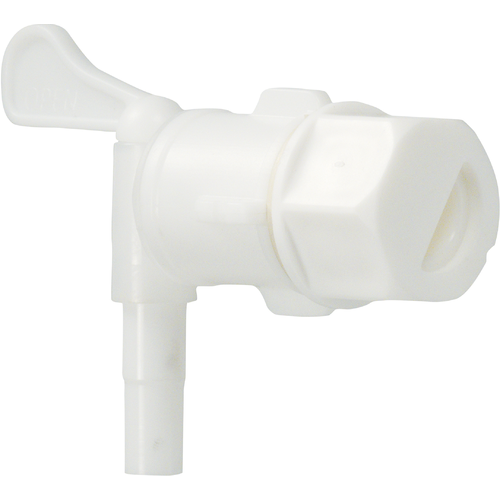 Spigot includes gasket and sediment blocking lock nut and can easily be removed for cleaning and sanitizing. If you use the bucket for fermentation be sure to use care when cleaning. Do not use any abrasive pads that could scratch the interior surface. Once you get a scratch in a plastic bucket it is very hard to sanitize. This is also why we don't recommend storing equipment in a bucket between uses as a fermenter. A hot PBW soak is usually all you need to clean a bucket after fermentation. Good reviews, ok price, hoping for quality! Intend on using a brewinabag specifically for cold brew coffee. Left my last one outside, now its all disgusting inside. My old one is scratched up. works great for our cold brew coffee system at work! Because bottling directly from the carboy from a syphon is a hassle. What are the dimensions of this fermenter? What size tubing should be used for transfer? 3/8" is too small. From the product description: "Once you get a scratch in a plastic bucket it is very hard to sanitize." Mine was delivered with several scratches visible on the inside. It came as part of the Premium Home Brewing Kit with the kit parts and tools packaged inside the bucket. Evidently, the tools/parts bounced around during transit, gouging the inside of my new bucket. Spigot doesn't leak, neither does bucket. So it seems good. Lid is gravity only, no sealing airtight. But you need a bottling bucket and it's cheap. Very well built. Can't wait to brew my first bath in the bucket. No complaints here. Works as it should and is currently fermenting my pinot noir. Nothing fancy. I use it for measuring boil water, cleaning, and for bottling. 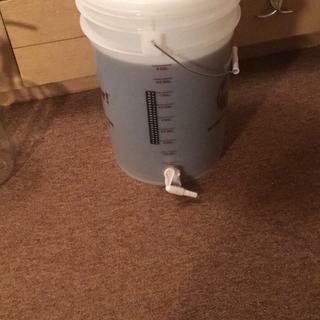 The faucet could be lower so I don't have to tip the bucket during bottling. I was suspicious of the plastic spigot until I used it. It has a solid open and close, no leaks or spills. I'd note as well that I've never had any difficulty with off tastes from any of these plastic buckets. I use for initial ferment before transferring into a secondary fermentor. Easy to clean and take apart. What else can I say. It's a bucket. Spigot seals good, no leaks. I use it for fermenting and I don't plan on going into carboy's. I will probably stick with these buckets for a while. Plus no nonsense when racking. You will be better off using this for bottling rather than for fermentation. But it does a great job for both tasks. You just have to be careful with scratches when using for fermenting as they can hide nasty stuff that will ruin your beer. Glass won't scratch but is fragile so there are trade-offs. If you add another spigot you can cut your time spent bottling in HALF! *there is no evidence to support this claim. Bucket and spigot are great but the lid doesn't have a gasket so it doesn't seal completely airtight. this bucket works great, you can use it as a secondary or primary. You can use it to clean with by using star san to sanitize equipment. Great little bucket to have around. Great food grade bucket with spigot! I use mine to bottle batches. You can never have enough buckets! I've used several of these over the years and consider it a standard piece of equipment in the homebrewer's arsenal. I only keep liquid in it while bottling, because around the spigot area it does tend to leak a bit. It is good to change the gaskets once in awhile, depending on how much you use it. Also remember it's a good thing to take apart the spigot assembly and wash off after bottling to prevent bacteria buildup. Since this item is plastic just make sure you don't clean with any kind of hard or abrasive material. Scratches harbor bacterial infections for future brews. I've had 2 of these and both spigots have sheared off within 3 uses. The first one that I got with the equipment starter kit sheared on batch 2, after the beer had been fermenting. I lost 5 gallons of nearly ready beer on my basement. I learned my lesson and have not fermented in a spigoted fermenter since (even though morebeers kit comes with 2 buckets with spigots...). The second time the spigot sheared while I was filling the bucket with sanitizer to get ready to rack the beer into the bucket for bottling. Long story short, use a siphon and a beer wand. Or drill/spigot a bucket yourself. Not worth the chance of wasting 5 gallons of good beer. I've used two of these bucket/spigot rigs, as primary fermenter, and as bottling bucket, for years with no problem. As others have noted, don't forget to disassemble, clean, and sanitize between the spigot uses. cleans easy and stores beer making stuff in between brewing ! The food grade plastic bucket works exceptionally well for filling the bottles. I am thinking of notching a hole or slot in the lid so i can incert the bottle filler in betweeen full and empty bottles. I use it to quickly measure 2.5 - 5 gallons. It is easy to use to sanitize equipment, fill up the kettle, or carboys. The spigot helps ease the pain of bottling. If you are careful with the gasket then you won't have leaks. The rotating spigot is great, you can have it low without needing to stand the bucket on anything. Only fermenter I've ever used. This is the only fementer I ever used. I see no reason to use anything else. 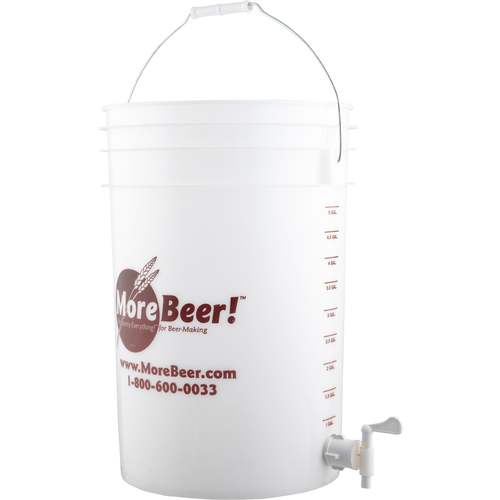 I?ve been home brewing for 7 years and I have just realized that plastic fermentation buckets with a spigot is the way to go. Easy to clean, easy to carry, and easy to transfer. My beer only stays in the plastic bucket for 14 days, (7 days 1st fermentation and 7 days for clearing) then its on to the corny keg to age and carbonate. This is way better than glass carboy. I've tried carboys and they're a pain in the you know what. I've found that buckets are cheap, easy to clean, are great fermenters and have a ton of other uses too. Been brewing for 7 years in buckets and never had a bad batch. Why change now? I love my buckets! Siphoning to a bottle from a regular bucket (without spigot) is fine and dandy but this is the better way to go. Why? a) The most important feature is it can potentially shorten the exposure time to oxygen of your sweet sweet beer. Just rack to this bucket and close the lid, no fussing with any equipment. b) Easier to control filling bottles than with a siphon. Use the valve to control the rate of beer transfer. In my experience, even with a spring loaded tip, the beer leaks out when you don't want it to while capping. c) The position of the spigot allows you to avoid filling a lot of the sediment into your bottle. At least more efficient than a run-of-the-mill siphon. I use these on brew days for sanitizer, PBW, hot water etc. I trust them for fermentation when they are new but after a couple batches they become all around cleaning buckets. Works as advertised, however be careful not to over tighten the spigot. If the seal gets smashed it can leak. My spigot actually cracked after a few years, probably from hot/cold water swings. This was after about 25 brews so probably needed to replace anyways. Also would be great if it came with a lid.